When I was out at the plot earlier this week, I was surprised and delighted to find that two of my Ruby Moon hyacinth beans had reseeded themselves. On Sunday, I didn't see any evidence of them. 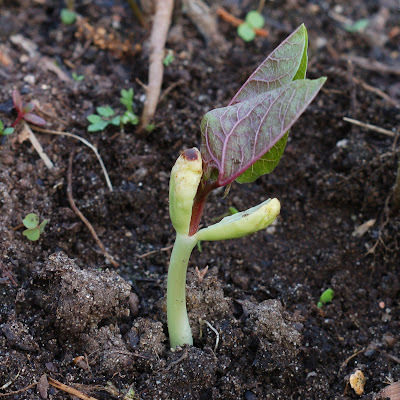 On Tuesday, they were fully emerged from the ground and already pushing out their colorful leaves. I think they are so interesting looking, like miniature purple fire-breathing dragons. Now I have to find a good place to put them. My plot neighbor, Steve, has his tomatoes planted directly on the other side of the fence, and I know these beans, once they grow up to their mature height of about 5 feet tall, are going to block his afternoon sun. He put up with my unruly, sprawling purple bean experiment last year (when I first planted them), but I'm feeling like I shouldn't subject him to it again. I'm trying to practice good plot-iquette. So I'm going to move these to a different area of the plot. Where? I'm not sure yet, because I already feel like I planted more things than I realistically have room for. The Ruby Moons are staying, though, for sure. So I'd better make a decision about moving them, and soon, because obviously they grow fast. I just stumbled across your blog--I love it! Great photos & info. Beautiful picture, but even more beautiful are the pictures in the previous post of your mature hyacinth beans. I've heard that the flowers are fragrant on top of being so colorful--what do they smell like? Some people are trying Hyacinth beans on teepee-shaped frameworks, but would your plot have enough space? The area I planted mine last year got too shady, so they made a few flowers, but were not the bountiful, glorious sight I was hoping for. Good luck on finding a place for them, Christa. I love hyacinth beans, mostly because of the intense purple of grew mine on 3 ft. high bamboo arches the seedpods. Last summer, I (sold at Home Depot for tomatoes, I think) and kept training them around. They looked quite cool and might avoid blocking the sunlight of your neighbour's plot. I'll be keen to know what solution you will come up with! !